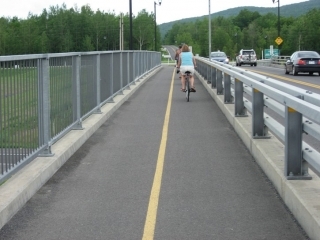 “L’Estriade” is a multi-use bicycle trail in Quebec’s Eastern Townships. For people who may be unfamiliar with the Eastern Townships, it is a fairly large region that is located about 100 kilometres southeast of Montreal, just north of the American border. 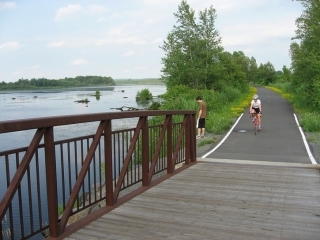 This region, known in French as “L’Estrie” or the “Cantons de l’Est”, has a number of lakes and ski slopes, and is a popular year-round vacation destination with Montrealers and tourist in general. 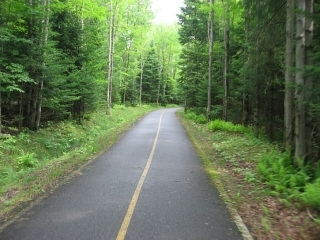 A scene from the Estridate Trail Network. 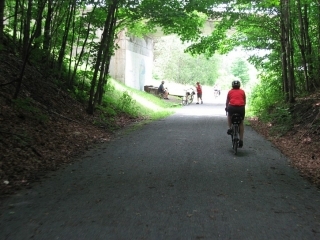 The ride on the Estriade Trail has to rate above average when it comes to pleasant scenery and relaxing surroundings. 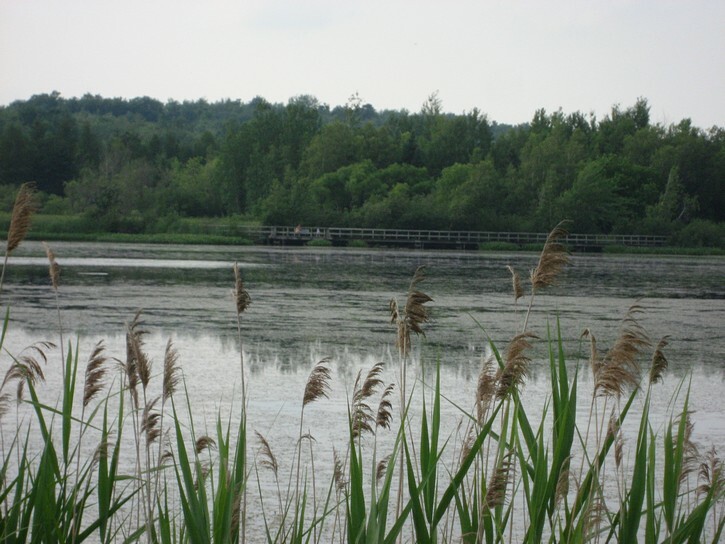 It passes by two urban areas, and it runs through wetlands, open fields, forested areas, a large regional park, and a provincial wilderness park. 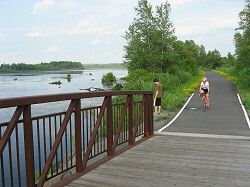 The trail is close to 50 kilometres long and is laid out roughly in a circular pattern, so it loops back on itself. 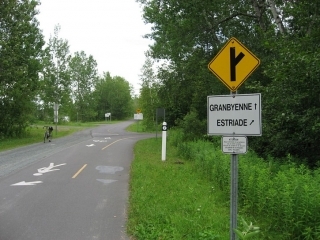 Technically, the northern part of this route includes “La Granbyenne” trail and part of “La Campagnarde” trail, but the entire loop is often referred to as the Estriade Trail network. 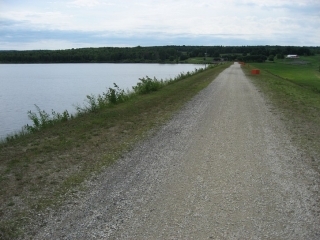 While a large portion of the trail has a good paved surface, there are some sections that are made of hard packed crushed stone. 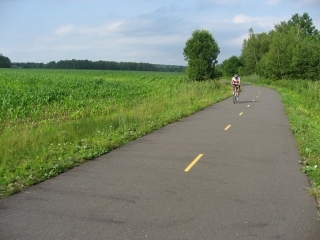 The crushed stone surface is generally easy to ride on with narrow road bike tires. Unfortunately, there are a few area where the crushed stone surface is slightly more coarse than usual, and people riding on really narrow tires (e.g. 23 mm wide tires) will have to pay a little more attention cycling through these spots. The whole loop is more or less flat. 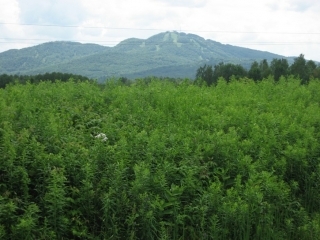 There are a few mild slopes and the odd small hill to contend with, but nothing too serious. 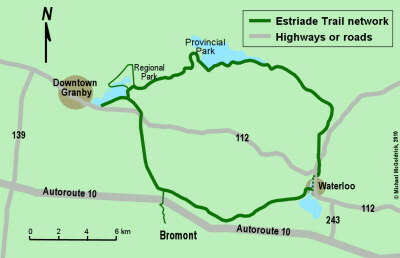 The main shortcoming with the Estriade Trail is that it is not long enough for a multi-day ride. Nevertheless, it’s ideal for people who have brought their bikes with them while travelling through the region by car, and are looking for a good place to take a nice ride. 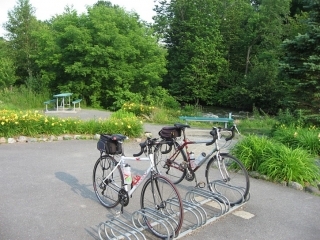 It is also well suited for family cycling. 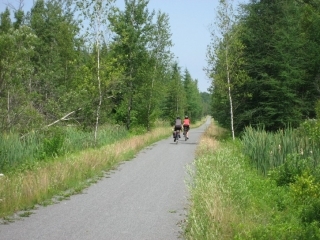 The trail is situated between the towns of Granby and Waterloo. Since the towns equidistant from each other on the loop, one could serve as a base of operations and departure point, and the other could be used as a convenient place to have lunch during a mid-day stopover. They are pleasant and attractive towns, but not overly touristry. Waterloo has that small-town feeling about it, even though it is home some industry, including what was one of the last bicycle manufacturing facilities in Canada (the old Raleigh factory). By comparison, Granby is much larger. It’s really a small city with a population over 45,000. 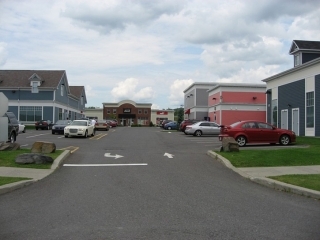 Both places are easy to get to from Autoroute 10, the main four lane highway which connects the Eastern Townships with Montreal. 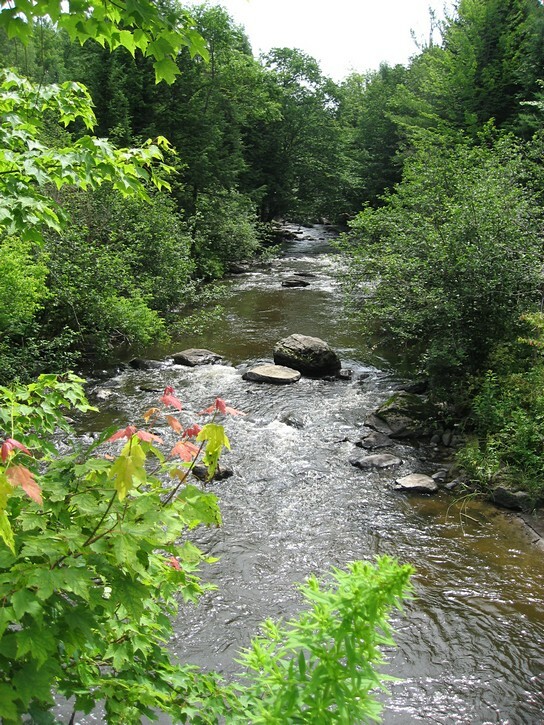 You may want to use Granby as your departure point, only because it is the larger of the two towns, and offers more facilities if you are looking for place to spend the night. If you do spend some time here, it should be pointed out that Granby is famous for its zoo. 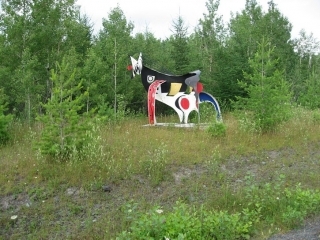 It’s located at the corner of Boulevard David-Bouchard and Rue De Saint-Hubert about two kilometres north of the downtown area. The Estriade Trail starts in an area immediately east of Granby’s downtown district, on the south side of Lake Boivin (next to Rue Denison). Here you will find a large parking lot, a tourist information office, and an old train station which now houses a McDonald’s and a very well equipped bicycle shop. Although not absolutely necessary, it is a good idea to drop in at the information office to get a map of the Estriade Trail. You will not cycle very far before you hit a fork in the trail. It will be time to decide if you will ride the loop in a clockwise or counterclockwise direction. 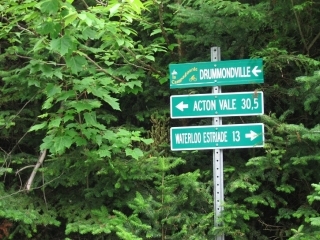 Go right (follow the sign for “Estriade”) to do the trail counter-clockwise direction. However, this article is presented from the perspective of someone who doing the loop in clockwise direction. This means staying left and following the sign for the “Granbyenne”. 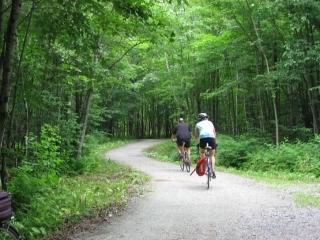 For the first 6 to 7 kilometres you’ll be ride through a regional park. It is quite an interesting place. 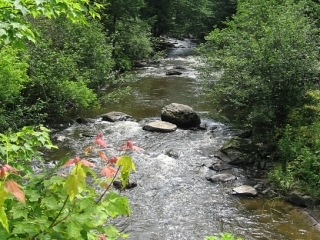 It has a good paved path, several small bridges, one small lookout tower, and numerous rest or picnic areas. The park has good signage, and there are maps of the trail network posted at key intersections. In addition to all this, you are sure to notice that there is a series of fascinating and sometimes weird art sculptures strewn throughout the park. 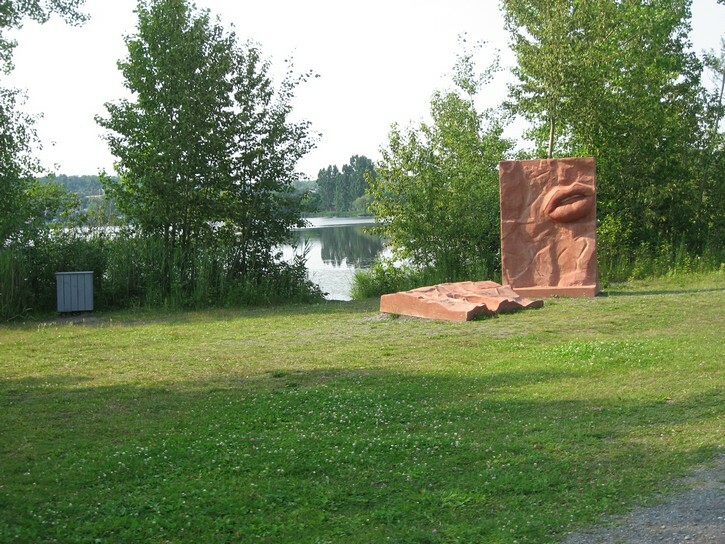 It’s worth cycling here if only to see these sculptures. If you would like to spend more time in this area, there are additional trails in the north side of this park that may be worth exploring. 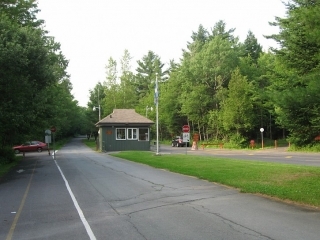 As you continue to ride the Estriade loop in a clockwise direction, you soon come to the gatehouse for the provincial park (Parc national de la Yamaska). 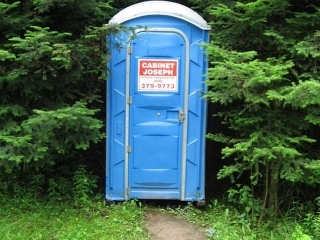 It normally costs money to enter the provincial park. 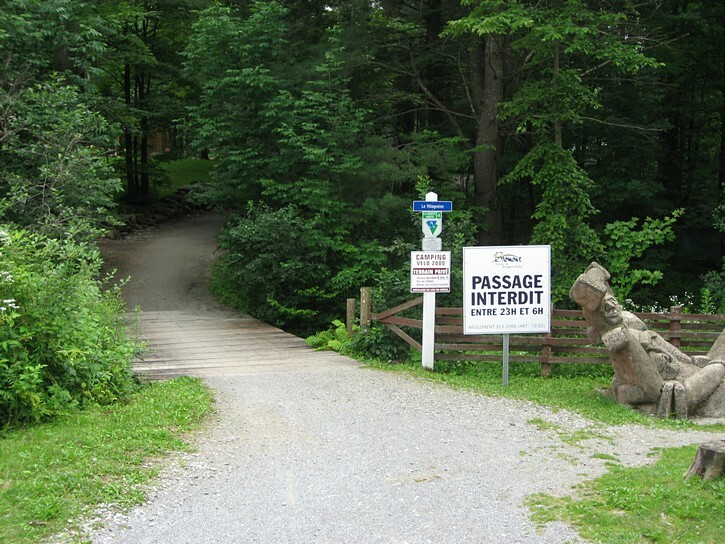 Fortunately, cyclists who are just passing through will be given a temporary pass for free (or at least this was the case in 2009). 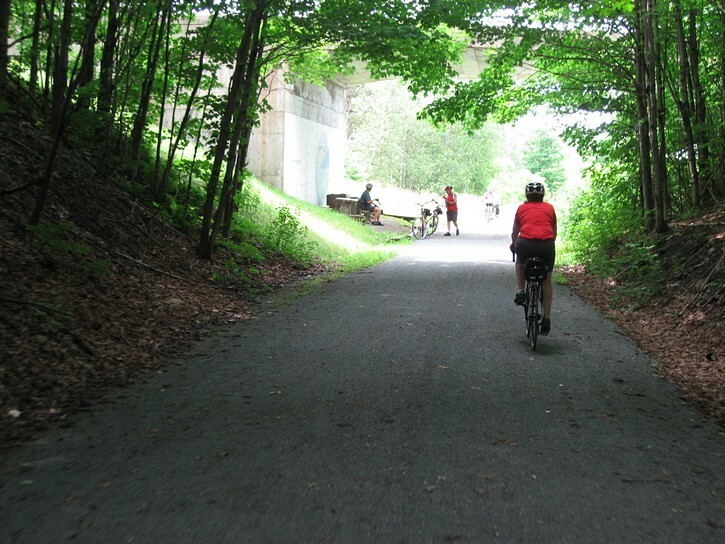 Once in the park you’ll be riding a crushed stone path all the way to Waterloo. At one point you’ll be cycling on top a relatively long weir which holds the water in the Choinière Reservoir. This is one of the areas where the crushed stone is a little more coarse than usual. 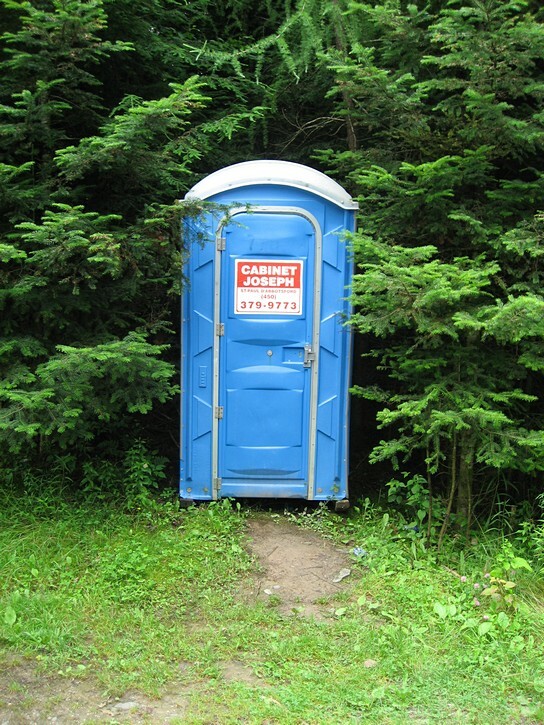 You’ll eventually arrive at an intersection in the middle of a forest where the path meets “La Campagnarde” trail. Turn right to go the Waterloo. When you get to Waterloo, the trail will bring you to Allen Street. Turn right, cycle less than 100 metres, and then left onto Foster Street, Waterloo’s main thoroughfare. If you’re looking for a place to eat, there are several restaurants on Foster Street, some with patios. 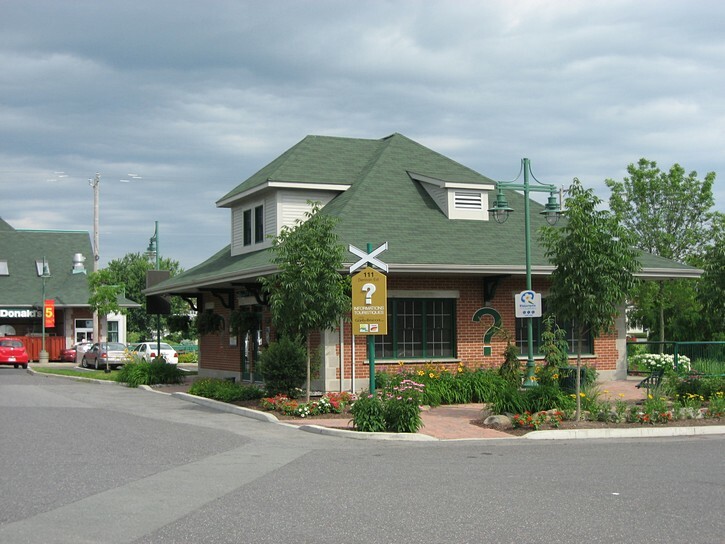 When it comes time to resume your ride, look for the tourist information office on the right side of Foster Street in the downtown area of Waterloo. 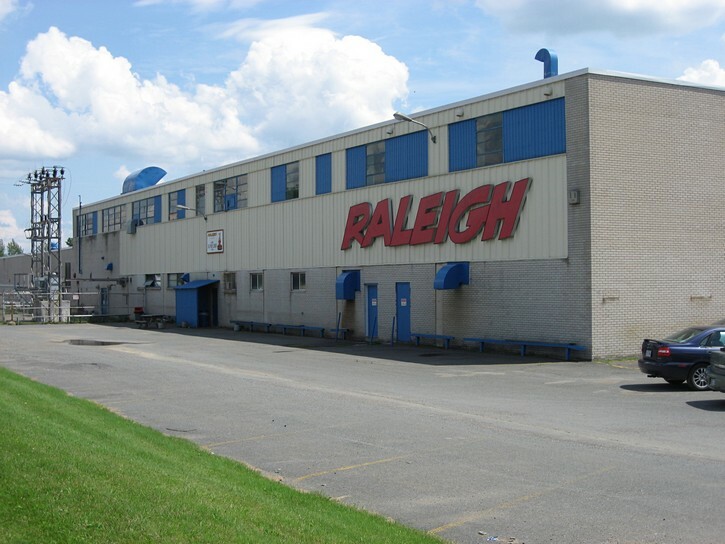 The trail runs right next to this building. 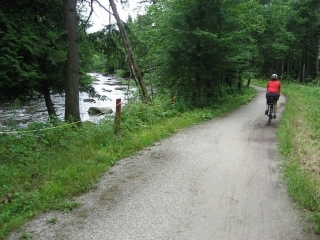 The trail has a number of twists and turns as it leaves Waterloo, but it is easy to follow. 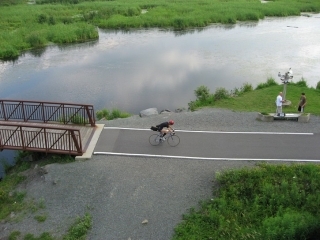 You’ll now be riding the southern portion of the loop back to Granby. This part of the trail is officially called “L’Estriade” and is close to 22 kilometres long. 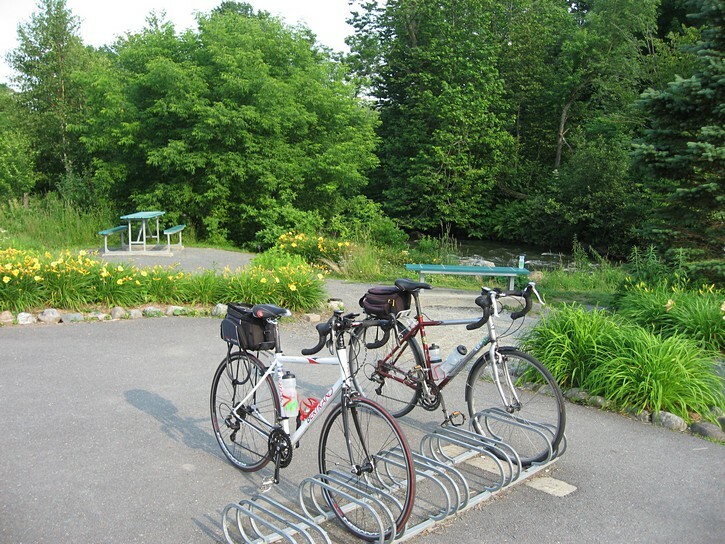 It was built of on an old railroad line, has a good paved surface, and is part of Quebec’s “Route Verte” bicycle network. After cycling a few kilometres, you see in the distance Mont Shefford on your right, and Mont Brome on your left. 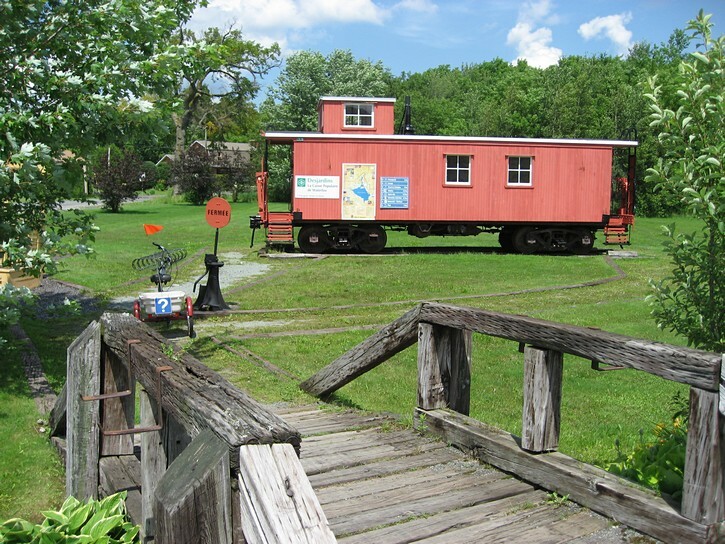 Before returning all the way to Granby, there is a side trip that you may want to consider. 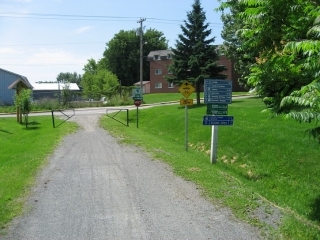 About half way between Waterloo and Granby is a turn off for a trail to Bromont called “La Villageoise”. 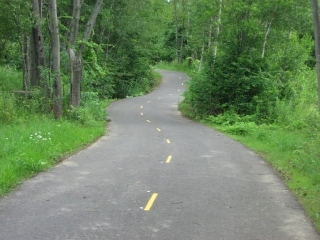 This trail is still being built, so you will not be able to go too far before having to turn back. The beginning of this trail is located in a camp ground, and there are signs which seem to be designed to discourage people from entering what is described as a private area. However, it is a trail that is open to the public. 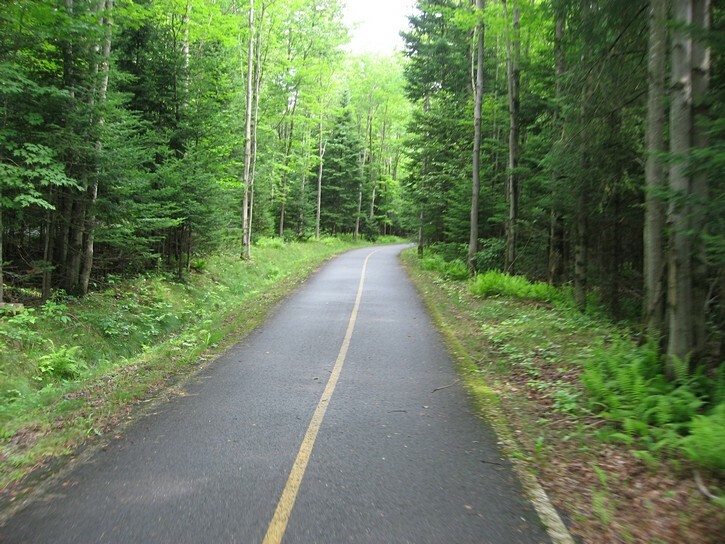 Once you cross the camp ground, the trail will lead you over Autoroute 10, a major four lane highway. On the other side, somewhat surprisingly, the trail leads to a small commercial centre which houses about a dozen factory-direct retail stores. 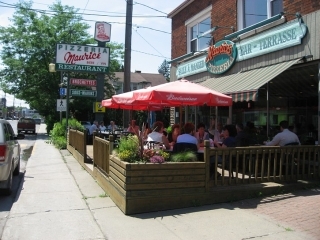 There are also several fast food type restaurants in this area. The trail resumes behind the tourist information office. 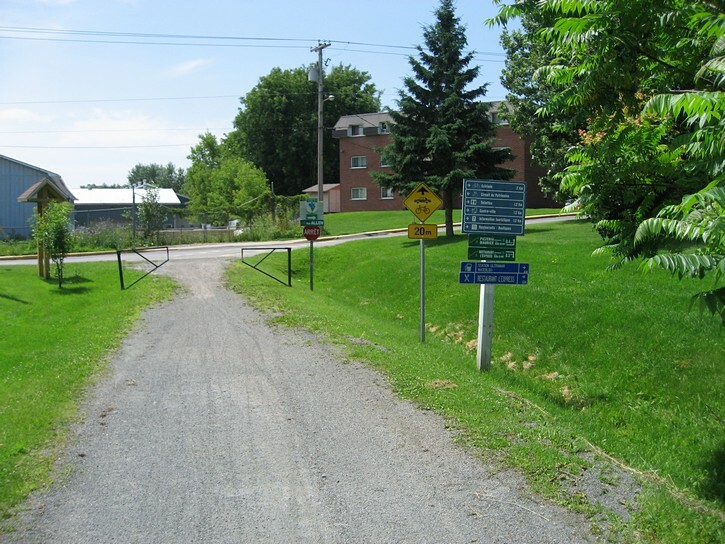 This next part of “La Villageoise” trail is fun to ride because it has an excellent paved surface, lots of twists and turns, and plenty of small hills (the fun kind, where you can use the downward momentum from one hill to climb the next). When it is completed, this trail will provide handy access to Bromont, a major ski resort in the region. 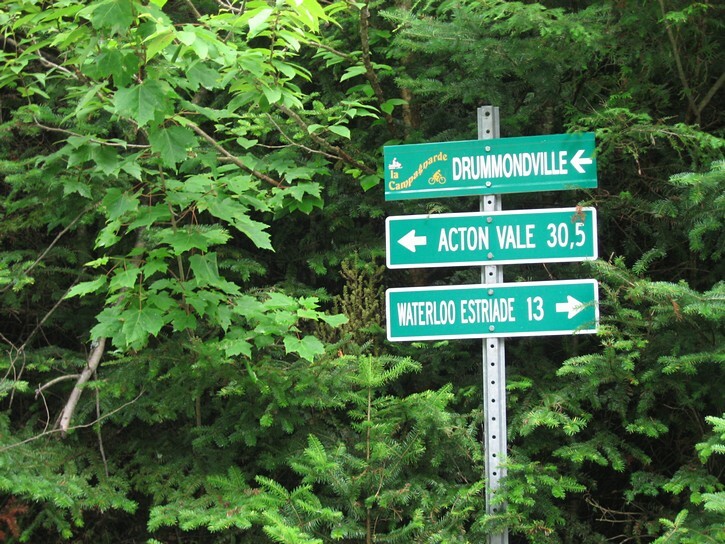 If you’re a mountain bike fan, you’ll be happy to know that Bromont is renowned for its system of excellent mountain bike trails, and that it has even hosted the World Mountain Bike Championships in the past. 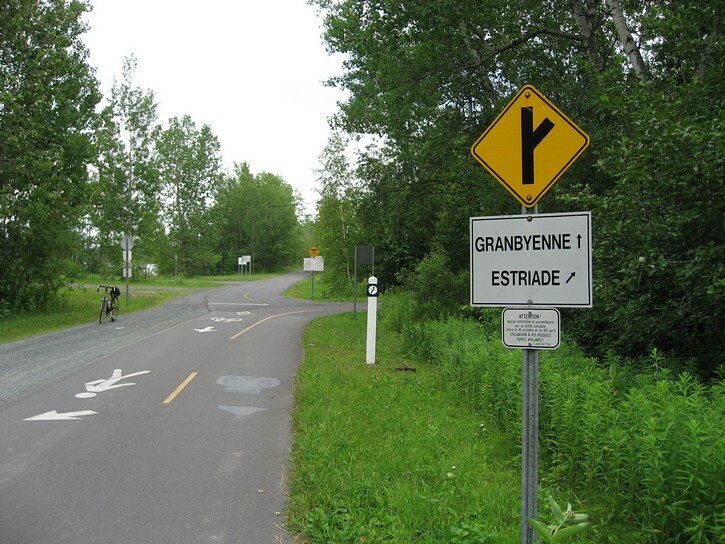 It will not take long to get to Granby when you get back onto the Estriade Trail. For the last couple of kilometres you will be riding down a slope that descends very gradually. If you started your ride early enough in the day, you will have enough time in the afternoon to visit Granby or to press on to your next destination, whether by car or bike. As noted earlier, the one drawback with the Estriade trail loop is that it is too short for a multi-day ride. 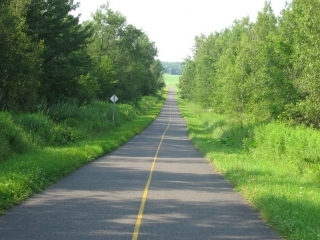 It may therefore be worthwhile to take a look what Quebec’s “Route Verte” has to offer for the region, and cycle one of its routes further into the Eastern Townships. 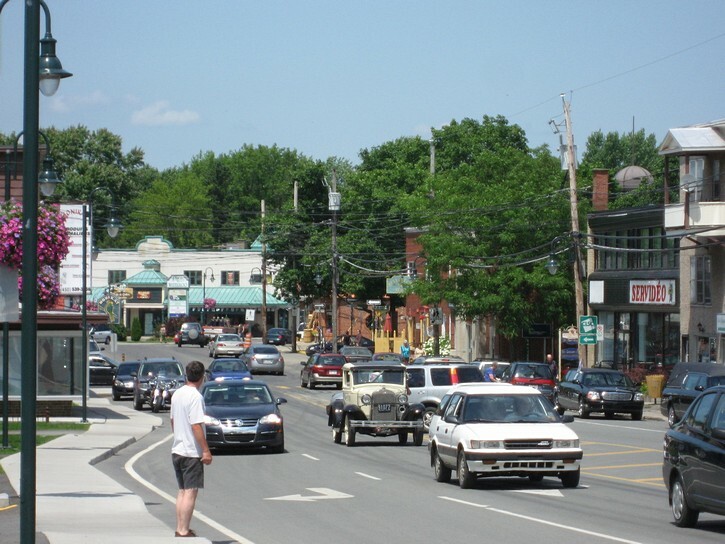 You could head to Magog, a very popular tourist centre, or to Sherbrooke, the region’s largest city (population of approximately of 150,000). 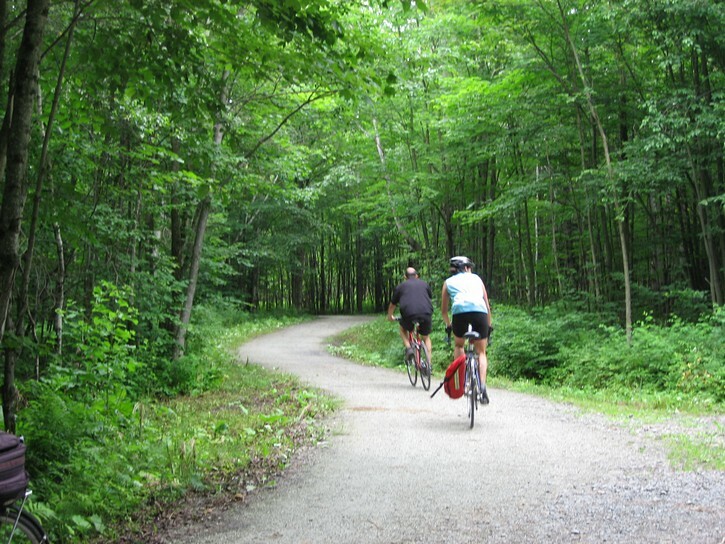 The area is very scenic, but be warned: the Appalachian Mountains protrude into a good part of the Eastern Townships, meaning that you will have to be prepared to cycle terrain that can be quite hilly at times.